Credit has been around for ages. We all use it in some form or another. So what is it exactly? Credit is receiving something of value now with the promise to pay for it later. Here’s an example: As a kid, suppose you were in a store and saw something that you just HAD to have – a shirt, new shoes, candy – but you didn’t have enough money to buy it. So, what did you do? You begged your parents to buy it and take the money from your next allowance. That’s credit!Or, while at a restaurant you realize you forgot your wallet. Your friend pays for your meal and you pay her back when you find your wallet. That’s credit, too! Now, these examples won’t be found on your credit report, but the concept is the same. On a very high level that is how credit works. If you pay back these loans with friends or family members quickly, you build trust and reputation, which increases your odds of being able to borrow more money in the future. This is the same concept that financial institutions, such as banks and credit card companies, use when determining whether or not to loan you money. These companies view your credit report and use your history to determine if they will loan you money, how much, and at what interest rate. The better your credit score, the higher the likelihood of receiving a loan and, typically, the lower the interest rate. 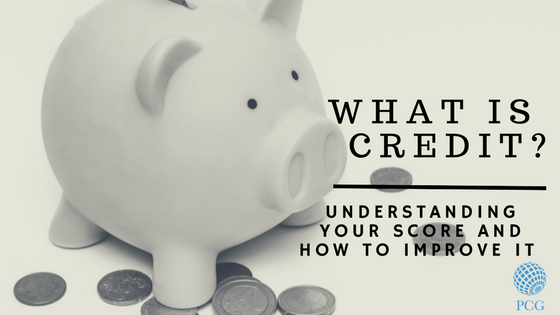 The key to good credit is understanding your credit report and how to manage each type of credit. Revolving Credit: Traditional credit cards fall into this category. You are given a maximum credit limit and you may make purchases up to this amount. You make payments each month and carry the remaining balance over to the next month (or revolve the debt). A good rule of thumb is to NOT carry more than 30% of your limit over to the next month. For example, if you have a $1000 credit limit, try to keep the balance under $300. While the lower the balance the better, keeping your balance at zero may not improve your credit, because it might be seen as an inactive account. Carrying high balances or “maxing out” your credit card will negatively impact your credit. Charge Cards: These are similar to credit cards, however, you must pay off the total balance each month. You cannot carry a balance. Installment Credit: These are loans for a specific amount of money that you agree to pay back in monthly installments over a set amount of time. Installment credit can be a car loan, home mortgage, student loan. Service Credit: These are other contracts that you agree to pay each month like utility bills, gym memberships, cell phone service, or the cheese-of-the-month club. Not all service agreements are reported on your credit history. However, if these are not paid on time, they may be reported to a debt collector and will negatively impact your credit. To have “good credit” means a lender can trust you to pay back the money loaned to you. The more trust you have, the more opportunities you have and the more money you will save in the long run, through factors like lower interest rates. Let’s look at a simple car loan. Say you have excellent credit and you take out a $10,000 loan to buy a new car. With excellent credit, you may receive an interest rate of 4.9% with a 60-month (5-year) payoff. This means you pay $188 each month, or $11,295 at the end of the five years. However, if you have no credit or bad credit and want to finance the same car, the results are very different. Because of your credit history, or lack thereof, you will end up paying for in the long run. For example, if you receive an interest rate of 9.5% (or maybe even higher! ), over 60 months you would pay $210 each month, or $12,601 in total. That’s $1,300 more than if you had applied for good credit. The lesson is clear: Good credit saves you money! And this is typically true whether you’re looking at car loans, a home mortgage, credit cards, or any of the types of credit. All-in-all, your credit history provides a glimpse of your character, your reliability, and your trustworthiness. Get Your Free Business Startup Costs Freebie! Want to start a business? Unsure of how much it will cost? Get our Business Startup Costs Freebie and sign up for our newsletter to get updates on business tips and advice! Success! Check your email for our free download!